I have always wondered why Brussels Sprouts enjoyed such a bad reputation among some people. I think that they look cute and have the perfect size for adults and children. With the new fashion of miniature vegetables like mini-squash, mini-zucchinis, cherry tomatoes, and baby artichokes, Brussels Sprouts should be highly praised. Besides, they are high in vitamin A, vitamin C, folic acid and fiber! All right, they have a strong peculiar taste... but I bet that most people don't like Brussels Sprouts because they only had them over-boiled, over-steamed at home or at the school cafeteria, just when too much cooking make them release chemicals that have a sulfur odor. My grand-mother used to grow them in her garden but she never really had them in quantities to feed us all on her home production. My dad, at le marché, would sometimes purchase them even though he was not a big fan of Brussels Sprouts. We have this joke in our family because one day, my mother had left some Brussels Sprouts in the microwave for my dad to eat (we would eat dinner with my mother and my dad would eat dinner by himself after he came home late from work). Somehow (and he generally knew there was something for him to reheat in the microwave), he did not "see" the Brussels Sprouts and ended up making himself something he really liked such as sunny-side up egg or a can of sardines à l'huile. Right. I think my dad suffers from discretionary vision! To this day, we still tease him about his "discretionary vision" when it suits him! The other day, we were at the market and my husband pointed at Brussels Sprouts. I was a little bit surprised because it's definitively not his favorite dish but since he was obviously in a mood for Brussels Sprouts we purchased some. That evening, as we were coming back from taking the kids outside, we were walking past a chain restaurant where we occasionally (like 3 times a year unless we have visitors) take the kids for hamburgers and fries. My husband was talking about how he could have hamburgers and fries that night... and was thus asking what we were going to have for dinner. Brussels Sprouts was on my mind... and as I was saying it, I could see the disappointment on my husband's face. Hamburger and fries vs. Brussels Sprouts? There is not even a chance for the Brussels Sprouts to compete. However, since we had purchased Brussels Sprouts, that's what we were going to have for dinner. Instead of boiling them, I sauteed them in butter with bacon and rosemary and let them brown in the butter until al dente. The recipe was not close to what I had at the restaurant but they were definitively better than my previous recipes. The fact hat we ate them all, that my children did not make any faces, any spitting, any bad comments was an evidence of the better recipe. I'm sure my husband would have rather had a hamburger and fries that evening but he did like the Brussels Sprouts....At least, he might be willing to purchase more in the future! Bon Appétit! In a large pot, over medium-heat, melt the butter and brown the bacon and rosemary. Add the Brussels Sprouts and carrots and cook, stirring occasionally so that the Brussels Sprouts don't stick to the bottom of the pot. You do want them to brown a little bit. This could be a great side dish with a pork roast. 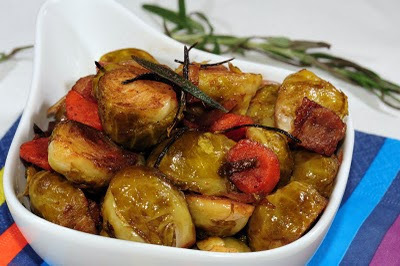 Another great way to eat them is roasted, with olive oil, I found the recipe in Barefoot Contessa. It totally transformed my opinion of the vegetable - they develop a delicious nutty flavor when roasted. Simply roast with some olive oil and some salt and pepper - hot oven - about 30 mins.